I have updated the eGroupware to the latest release, today I set the vacation Notice on my email address but unfortunately, it doesn’t work. Please always tell us the version. Then you’ll know which version we’re talking about in the future. I hope it is a package installation and not a git installation? today I set the vacation Notice on my email address but unfortunately, it doesn’t work. Please have a look at the webserver-error-log. The version of eGroupware is 17.1.20190222, I didn’t try this vacation notice earlier. Have you entered the correct data for sieve in your mail account? If you go through the account with the wizard, Sieve access will be tested and something will be displayed if it doesn’t work. after changing the port it should look like this but when I sent an email to this email address, I didn’t get an auto email. Plus when I just refresh the browser then this vacation notice is active disappears. and additionally the protocol of your mail server. Can your mail server even sieve? My mail server is 1 UND 1. I have read there is some kind of problem with the 1 UND 1 and sive server when they are used togather. What do yu think? please ask the IONOS (1&1)-support if the mailbox allows external access to sieve filter rules. Alternativ dazu können Sie auch eventuelle Sievemanager-Fähigkeiten Ihrer lokalen Mailsoftware nutzen. Diese kann Sieve-Regeln auf unserem Server über die üblichen Sieve-Ports 2000 und 4190 einstellen. Alternatively, you can also use any Sievemanager capabilities of your local mail software. You can set these Sieve rules on our server via the usual Sieve ports 2000 and 4190. The first error happens when EGroupware tries to give you the error happening while setting the vacation message. The second is a Warning happening when we try to parse the existing Sieve script. Are you sure your IMAP server supports Sieve? Stefan asked you that questions before, but no answer from you? 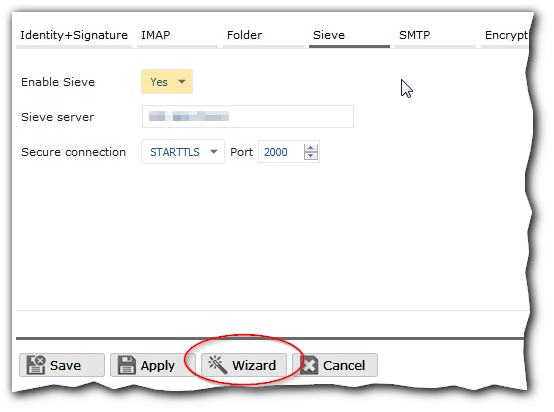 Does our mail account wizzard detects your server supporting Sieve? Sieve filtering and vacation notices is nothing EGroupware can do without your IMAP server / provider supporting it! Yes, the mail account Wizzard detects that server is supporting Sieve. I’m not quite sure whether 1und1 support external access to sieve. Every time, I don’t know how the sieve script works when I just apply a filter to move emails to a specific folder or to discard emails. Plus When I just set up auto email notification via thunderbird then our IMAP server flawlessly, it creates problems with egroupware while setting up vacation notice. Then finally clarify it with 1und1! You don’t necessarily have to know that. Therefore EGroupware provides a graphical user interface. How it works and what the rules are: Ask Google. I don’t understand what you’re talking about. You should only understand that sieve processing server-side rules and thus sorting mails on the mail server or replying an vacation-notice. Thunderbird sorts locally in the mail client using filters. Vacation-notice are not possible(?). yes, the thunderbird sorts locally in the mail client. but vacation notice can be set up via thunderbird. 1und1 Support external access to Sieve Script, the vacation notice still not to be applied via eGroupware. It’s a good feature but I’m unable to use this feature. Which settings are necessary for server, security and port? but vacation notice can be set up via thunderbird. Hmmm. Can you please explain how this works? That would be new to me that Thunderbird can do that. I just added mail filter on the egroupware Mail filter portal then these filters are automatically set up on the 1und1 mail filter setting as you can see in the picture. the egroupware mail wizard show me the setting is fine as shown below. Thunderbird doesn’t work with sieve filter such as vacation notice, rather I just added a mail filter on Thunderbird such as soon as I got an email, then Thunderbird sent an auto-response to the sender. Does a simple mail filter work? E.g. move it to a subfolder? Yes, simple mail filter work such as moving emails to a specific folder.